Island Princess has a variety of different dining venues. Each offers a unique dining experience. To help guide us through these venues, I asked Ignoazio D'Agostino, Island's Maitre d'Hotel to give us some insights about dining on Island Princess. Mr. D'Agostino has been with Princess since 1984 and is responsible for Island's main dining rooms and specialty restaurants. Princess refers to itself as "the consummate host and Mr. D'Agostino is passionate about this role. "This job you can't do it just because you have to do it, you have to love it. You have to love it in the sense to be accommodating, be smiling, be friendly to the customer. I believe that if a passenger is happy in the dining room, 99 percent [of the time he or she is] happy about everything." Island Princess has two main dining rooms, The Provence and the Bordeaux. One is located on Deck 5 and the other on Deck 6 directly on top of each other. The layout of both rooms is essentially the same, as is the décor, the service and the menus. While the Bordeaux serves breakfast, lunch (sea days only), afternoon tea and dinner, the Provence is only open for dinner. Breakfast, lunch and tea are done on an open seating basis and are open to all guests. For dinner, guests must select either the Provence or the Bordeaux. The Provence features the traditional cruise ship dining system in which guests are assigned to a specific table at either the early seating or the late seating. It appeals to "people who like to dine everyday at the same table, be served by the same waiter every single night and seated with the same people." 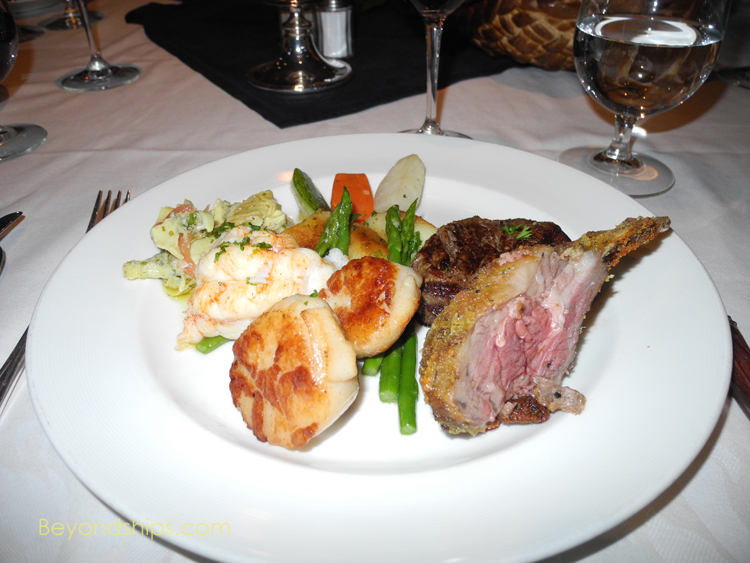 The Bordeaux features Princess' flexible dining program Anytime Dining. Guests may come to the restaurant any time that the restaurant is open. "From my point of view, the idea of the Anytime is great. The guests can call to make reservations or they can just show up at the door. If they want to dine by themselves, fine, if they want to enjoy other people, fine as well. It is more flexibility over all. It is a little more work for us but I believe on vacation you should not have to be thinking ‘I have to go [to dinner] at this time.’ The idea is to escape completely and just show up whenever you feel. Lately, it has become very, very popular; let's say 60 to 65 percent choose Anytime." D'Agostino points out that Anytime Dining is particularly valuable when the ship has been in port for the day. "I have worked almost 27 years for [Princess] and I remember that people were missing the first seating and the only option for them was to go to the Horizon [the buffet restaurant]. Now, when we are in port, people do not have to rush to come to dinner." In theory, a drawback to flexible dining programs is that you are not guaranteed to have a table at any particular time so the restaurant may not have a table for you if you arrive at a popular time. However, D'Agostino, explains that this is not a significant problem in practice. "The first few days, people tend to come early. After two or three days the flow of passengers changes. They start to come, not everybody as soon as we open, but at 5:30, six o'clock, 6:30, 7:00. Sometimes there is a wait. We give them a pager if the dining room is full and we call them as soon as a table is available. The maximum waiting time is 20 minutes." Along the same lines, one of the advantage that the traditional system has had over flexible dining, is that over the course of the voyage, you come to know your server and he or she comes to know your likes and dislikes. Princess, however, has evolved its flexible dining program so that guests choosing Anytime Dining can also have this benefit. "I have customers, who love to be served by a specific waiter so they ask me to be seated at [his] table I will do a standing reservation for them. They ask me, for instance, I want to sit with Alfredo at six o'clock every night. We will do it. No problem at all." As noted earlier, the two main dining rooms use the same menus. However, "every night is a different menu." The menus are geared to different themes. "We have on different nights: Chef's Dinner, Italian Dinner, the Welcome and the Captain's Gala Dinner and according to the place [where the ship is sailing], Caribbean night,. Every night we have a different one." While the right hand side of the menu changes each night, the left hand side presents a roster of items that are "Always Available." "We know that people enjoy the filet mignon, people enjoy the shrimp cocktail, the chicken breast, the salmon, the fettuccini Alfredo so we always have [them on] one side [of the menu]. For instance, if there is a Caribbean theme and they are not into the Caribbean food, they may choose from the Always Available side." Operationally, the two restaurants are organized in the same way. "In each dining room I have 30 [waiter] stations. Each waiter, supported by a junior waiter, has three tables - - one table of eight, one table of six and one table of four. Thus, for 18 to 20 passengers, we have two persons to take care of them. If you go to a restaurant ashore, you will see that the waiters have seven, eight, nine tables and they are by themselves. Here, they just have to focus on those three tables and provide the personal service to our customers." In addition, "we have three [head waiter] sections in the Provence, and three sections in the Bordeaux. You will see the head waiter in charge of a section going around to track passenger satisfaction and to ensure that the food and beverage service complies with what is required by Princess Cruises." "It is very important for us for our crew to be smiling, to be accommodating, to place any passenger request - - that is the key of our business.” To achieve this, "training is ongoing on every cruise, and we focus a lot on how to be the consummate host." Furthermore, "the happiness of the crew reflects in the service provided to our customers." Therefore, Princess also focuses on the quality of life for the crew. For example, in the crew dining areas, which Mr. D'Agostino also oversees, "Our priority is also to give great service to our crew, the officers and the petty officers."